By Joanna Andrzejewska and Mateusz Mucha. Where is the smallest Gender Pay Gap? What can women do to fight the gender gap? What can countries do to close the Gender Wage Gap? Which country has the smallest Gender Pay Gap? What can every woman do earn more? Gender Pay Gap is a universal issue. There are countries, like Iceland, that decided to ban the thing altogether, but in most places of the world, women earn less than men. How much less? How do gender and nationality affect your pay? Some women fought for their paycheck so hard that they earn what they should, not what the employer offered them. But according to studies, the gender pay gap comes from at least some element of discrimination. But still, there are some things that woman can do to earn what she should. There is a hypothesis that women just don’t negotiate their salaries, so they earn less. It’s not true, but what’s true is that you always have to negotiate your paycheck. New Statesman magazine wrote a story about how several women earned more thanks to their negotiating strategies. For example, one of them wrote down a list of reasons that she deserved more money than it was advertised. She memorized it and told her future employer all those reasons and got what she wanted. Sometimes you earn what you’ve managed to negotiate, not what you deserve. The lesson is: always be prepared and use facts in the negotiations, even though the other side won’t use them. Have you ever met a male colleague that always talks about how much he does and rarely do the words meet the actions? It turns out, on average, the louder he speaks, the more money he will get. Don’t be afraid to speak about the work you do. People will remember that, and eventually, you will get the paycheck you want. The Balance, a financial website, wrote about a 2016 report by GlassDoor about the wage gap. One of the reasons, as is reported, for women earning less is the career path. As it turns out, men and women choose different careers because of social pressure, not their abilities. 'This means that you need to be mindful of the career path you choose. Are you in your job because you want to? Or is society determining your career?’, writes The Balance. Every little decision you make can impact your future earnings. The best thing you can do is to listen to what you want to do to earn a living, not what society tells you to do. Strengthen the legal framework and its enforcement for combating all forms of discrimination in pay, recruitment, training, and promotion. Reduce barriers to women entrepreneurship and ensure equal access to finance for female and male entrepreneurs. Develop and implement initiatives and programs aimed at addressing women's financial literacy needs. So… why does the Gender Pay Gap actually exist? The study of wage discrimination began in 1957 with the work of Becker (Becker, G. S., 1957, The Economics of Discrimination. Chicago: University of Chicago Press) and since then it became a routine task of labor economists. STEREOTYPES - there are jobs considered to be reserved for women and others that are supposed for men only. It’s the latter that means a higher salary. RACE - studies from the United States show that non-Hispanic white and Asian American women earn less than their counterparts of other races. Plus, within their racial/ethnic group, the disparity between their incomes and incomes of men are bigger. AGE - women usually get 90% of what men are paid until they are about 35. Then, median earnings for women grow slower than men’s until the gap widens to 19-24%. PURE DISCRIMINATION - differences in wages are perceived as the most common form of indirect discrimination of women. Many factors are contributing to differentials in earnings; they cannot, however, account for all disparities. The remaining unexplained portion is attributed to discrimination. We've taken the data from Eurostat, OECD (source no longer online) and Monster Salary Index. In those cases where datasets overlapped (for example, both databases contained the statistics about Germany), we took data from the body that's more "local" (Eurostat for European countries). Joanna Andrzejewska and Mateusz Mucha. 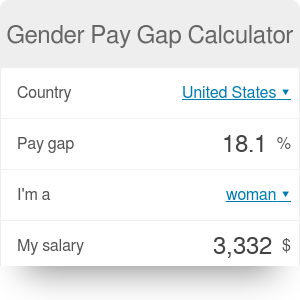 Gender Pay Gap Calculator can be embedded on your website to enrich the content you wrote and make it easier for your visitors to understand your message.